Erythema toxicum neonatorum is a skin condition seen in about half of newborn infants. 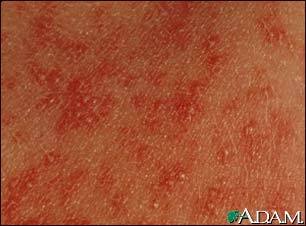 It consists of reddish patches that have raised clear bumps in the center. This condition may be present at birth or appear shortly thereafter. It usually lasts several days and clears up without treatment.